Review of HobbyKing RX3S Gyro on a plane. 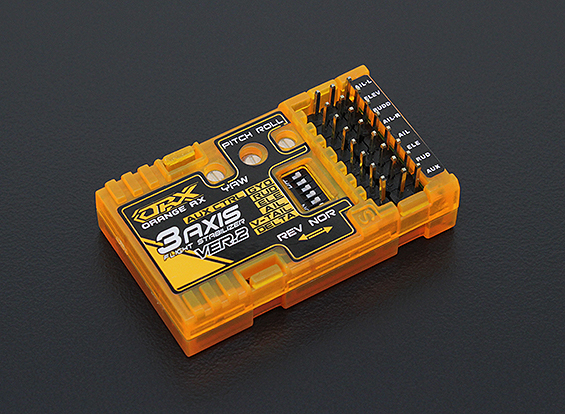 I'd love to see the RX3S OrangeRX 3-Axis Flight Stabilizer V2 used on a production/non-scratchbuilt plane and see the with or without comparisons during flight. Especially as used on a tail dragger with horrible ground handling to see if it will straighten up the roll-out. That's a good idea. Maybe I'll try it on my big nitro cub. Could on my HZ cub too I suppose. I didn't notice they had a version 2. My ECOMRC Miss Elaine really want's to whip her tail around on take off. I ordered three of these gyros but haven't installed any yet. My nitro cub is kind of a handful until you get some air over the tail. I get used to 3D planes with huge control surfaces and slow stall speeds then fly my cub and it takes me a while to get used to them again lol. The more I think about it, the more I'm convinced I'm putting one on my cub before summer. There have been a few reviews on FT, mostly of the V1 module. The V2 module supports delta wings and v tails, as well as having a switch that allows it to be cut off in flight. Heres a thread about it on rcgroups. Come on guys, there's been about a bazillion videos on the Parkzone Wildcat also, but FT did a video. They did an article on stabilization awhile back, but they used an i86. That was just about the time Hk released V1. I added three of the RX3s V2 to an order last month and tried them out over the weekend on the workbench. With the V2 sitting completely still the servos I had connected were noticeably jittery and the servos lagged randomly exactly like they did in this guys video. I tested with some TG9e, HXT5010, and Solar D228 digital servos. All did the same thing. Funny thing was that when I stuck the v2 into my Bixler there was no problem at all.